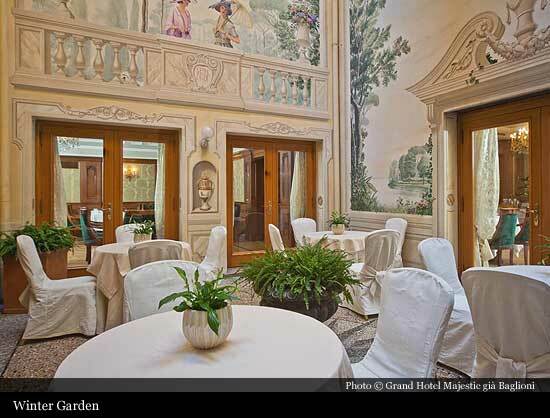 Facing the city’s Cathedral, the Majestic Grand Hotel – formerly known as the “Baglioni” is situated in a Palazzo designed by Alfonso Torregiani during the 18th century and built by order of Cardinal Prospero Lambertini, who later became Pope. In June 1909 the Curia sold the building of the Archdiocesan Seminary, which was then converted into a hotel in 1912 by the engineer Gasperini. 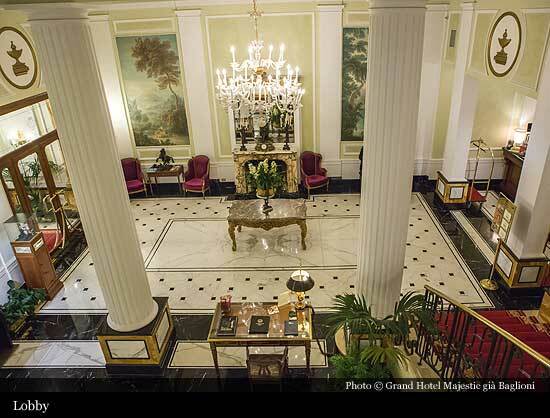 With its singular location and proximity to theaters and trendy venues of the time, the hotel soon became a destination for upper class tourism. A new floor would be raised in 1924. 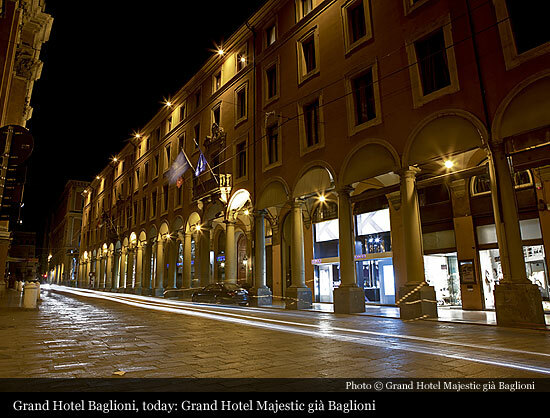 On the night of October 18th, 1944, in an attempt to destroy a Nazi commando located at the Grand Hotel Majestic già Baglioni, six members of the G.A.P. 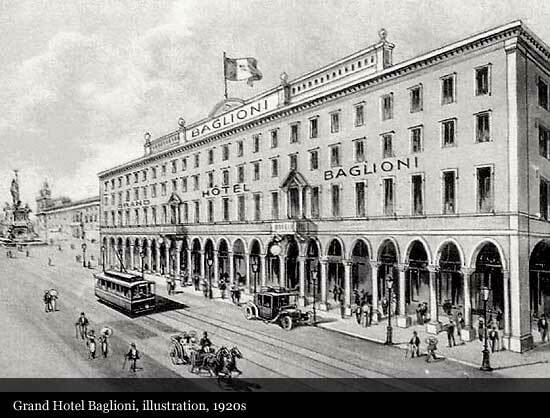 (Gruppi di Azione Patriottica – Patriotic Action Groups) placed a box of dynamite near the hotel, destroying the central part of the building and a portion of the façade. The current appearance is thus partially due to renovations after that date. 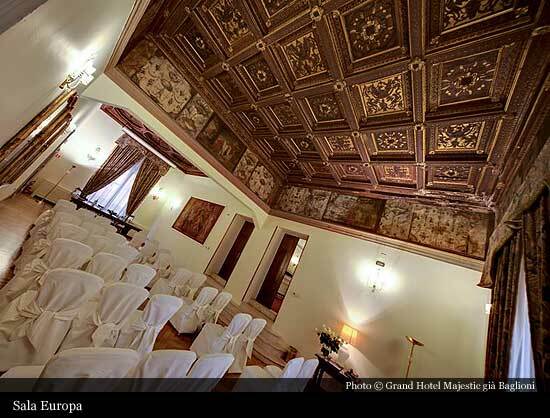 On the main floor of the Grand Hotel Majestic già Baglioni, it is possible to admire a frescoed room, one of Bologna’s most valuable artistic and historical examples of civil construction. The so-called Camerino di Europa (the Little Room of Europa) was probably the first major commission entrusted to the brothers Agostino and Annibale Carracci. 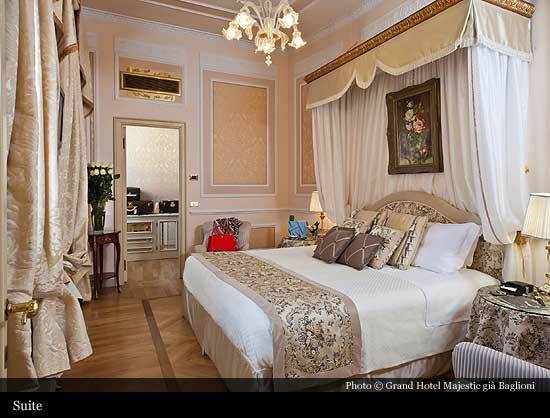 The 109 rooms have a mix of antiques fornitures with modern amenities, a perfect blend of classic italian style, elegance and hospitality. 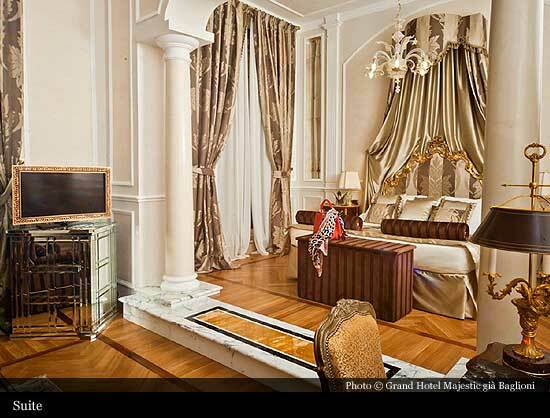 The 4th floor refurbishment has enriched the hotel with a new range of Junior Suites and Deluxe Room. 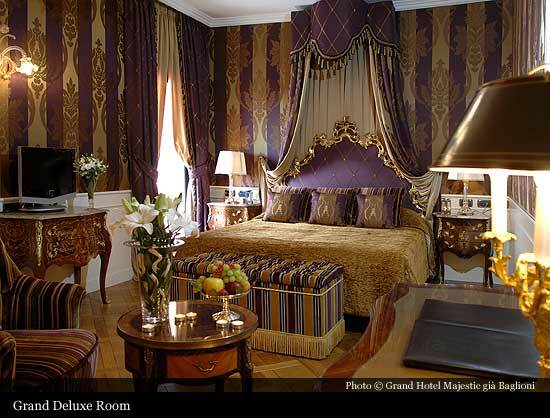 The style in this case is classic 18th century classical french. 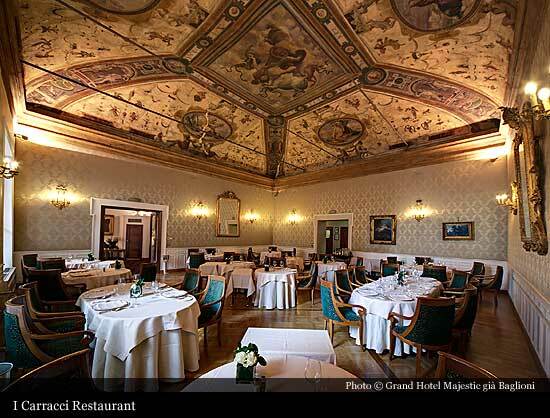 The hotel is famous for its I Carracci restaurant with it’s frescoes, which is rightly regarded as among the most sophisticated and elegant in Bologna. 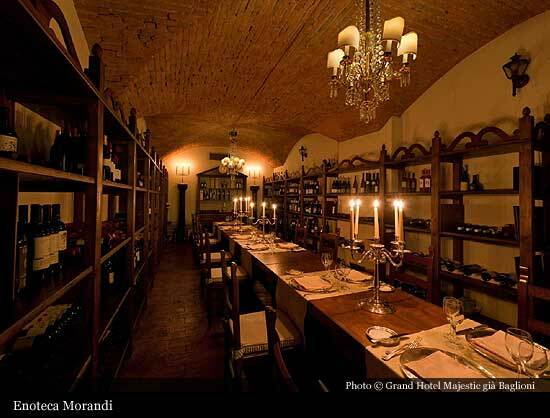 The building is located in one of the most interesting archaeological and architectural areas of the city center. It sits near the intersection of the two main axes of the Roman road system: the north-south cardo, today via dell’Indipendenza, and the east-west decumanus maximus, now via Rizzoli-Ugo Bassi, the urban section of the via Emilia (189 B.C.). 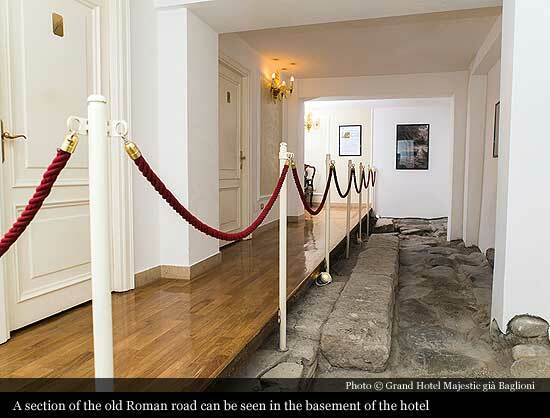 In the basement of the Grand Hotel Majestic, a ten-meter section of road belonging to a minor decumanus can still be seen. 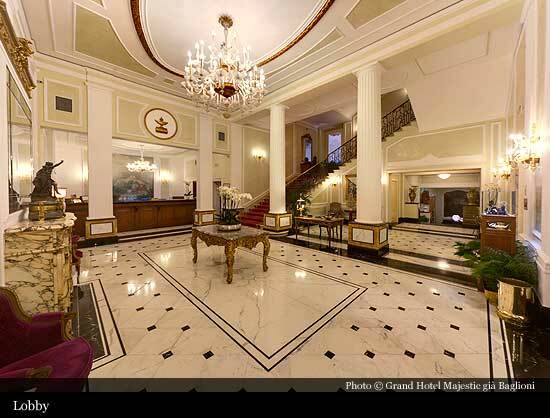 In 1990, the Majestic Grand Hotel (formerly “Baglioni”) became member of the international association Leading Hotels of the World, which affiliates the best hotels in the world. 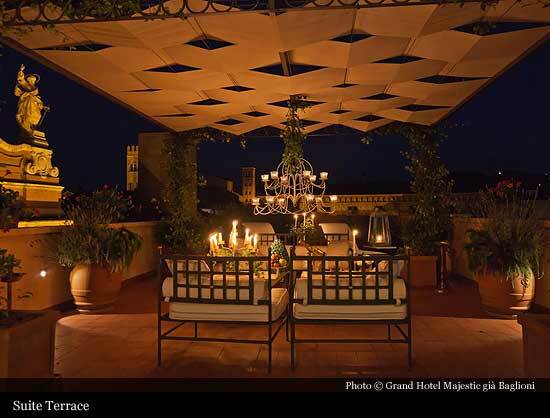 In 2010, the building was acquired by Duetorrihotels Group ltd: a young and dynamic Italian company that is active in the ‘Made in Italy’ luxury hospitality sector. 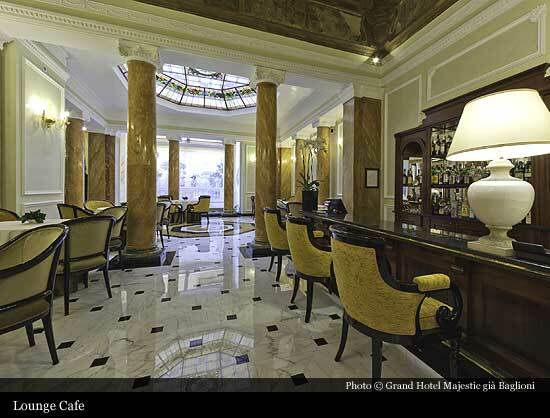 Many celebrities chose to vacation in Grand Hotel Majestic since the first years of 20thcentury: Richard Strauss, Filippo Tommaso Marinetti and many others representatives of Italian Futurism. 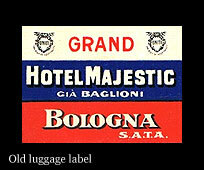 During the Fifties, the stars moved to Bologna: Clark Gable, Ava Gardner, Frank Sinatra, William Holden, Gina Lollobrigida, Sean Connery, Sophia Loren, Alida Valli, Anna Magnani, Burt Lancaster, Dodo D'Hambourg, the beautiful Black Widow of Crazy Horse of Paris. In the Eightes, Monica Vitti, Wim Wenders, Federico Fellini, Ugo Tognazzi, David Ian Hewlett, Giancarlo Giannini, Roman Polanski, Monica Bellucci, Vittorio De Sica, Mat DiIllon, Hayao Miyazaki, Dario Fo, Spike Lee, Gabriele Salvatores, Roger Moore, Christopher Lambert, Emir Kusturica, Gerard Depardieu, Philippe Noiret, Claudia Cardinale, Roberto Benigni, Hugh Grant, Woody Allen, Giuseppe Tornatore e Julia Roberts. Cinema but also music with the Divine Maria Callas, Luciano Pavarotti e Placido Domingo. Again,Bob Dylan, Miriam Makeba, Paul McCartney, Milva, Patty Smith, Anastacia, Sting, Elton John, Princess Diana, Prince Albert of Monaco, Nobel prize as the Dalai Lama.